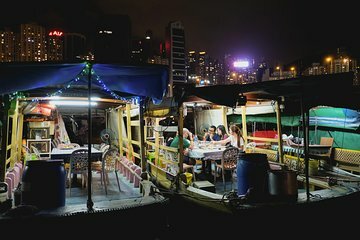 Opt for the ultimate dining experience in Hong Kong with a seafood feast on a traditional sampan (Chinese boat). In a small group limited to 12 people, you’ll board a sampan boat restaurant and pleasure your palate with six courses of Chinese cuisine. Typical dishes include razor clams with minced garlic, clams and black bean sauce, typhoon shelter crab, and crab noodles, accompanied by Chinese Hua Diao wine. Plus, you’ll witness an ancient Chinese folk ritual at the start of your experience. After seeing this on Anthony Bourdain's parts unknown, I searched high and low for it and so glad I got to experience the sampan dinner. It is truly a unique experience and the highlight of my trip in Hong Kong. The voodoo ceremony at the beginning was a hoot, I won't spoil it for you and it's best if you just experience it for yourself. The dinner itself was exceptional - fresh deliicious seafood and a wonderful guide that helped us put into perspective what we were eating and all the other interesting things that we would have otherwise missed. We would highly recommend this with Humid with a Chance of Fishballs! Their company name is also a hoot as well!